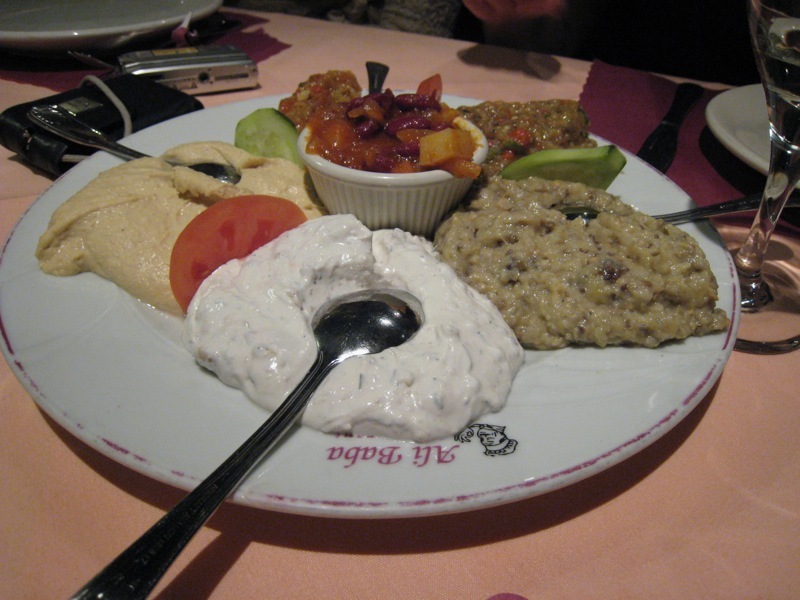 To celebrate Monica & Jae’s birthday, a night of Turkish food and partying at Vig 27 was planned. Sarah (all the pictures here are courtesy of Sarah) picked the restaurant, and it was a great choice. From outside, Ali Baba Ali baba is unassuming, no more than 12 feet wide. When you walk in, it’s a tight fit, and it seems like a small place. But as you walk back, the restaurants gets wider and the ceiling goes up, and then, if you’re in a group, as we were (12 people), we went all the way to the enclosed garden, that had a large space heater. There were two other large groups in the garden with us. The employees at Ali Baba all seem to have an accent, which made communication a bit iffy at times, but mostly things works out. Such as ordering two large plates of the Mixed Appetizers. Each includes lebni, hummus, eggplant salad, ispanak eggplant, and pilaki. These were accompanied by absolutely delicious bread, sliced into strips, lightly topped with black sesame seeds. The ispanak eggplant (which had lots of sauteed onions and peppers) was the clear winner for everyone at our half of the table. 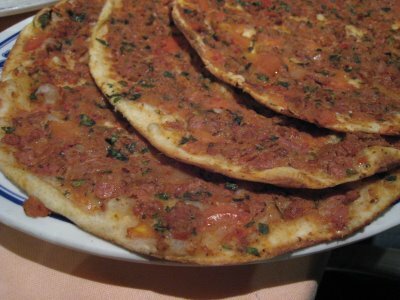 The communication issues did create confusion when we ordered lahmacun, for which Ali Baba is well known. We tried to understand what the difference was in portion size between the large plate and the appetizer plate. Our waitress explained that the appetizer was the diameter of a drinking glass and the large plate was “three pieces”. So for twelve, we asked if we need four of the large plate — and the waitress sort of shrugged and said yes. We decided to just get three plates and then another hot appetizer of Arnavut Cigeri (fried liver cubes). It turned out that the “pieces” in the large plate were each about ten inches in diamater, and nine of them were way too much for appetizers. We took three and half pieces home! Everyone enjoyed the lahmacun, despite our ordering flaws and inability to pronounce the name. We topped them with the included flat leaf parsley, lemon, and other accoutrement. Our only complaint was that the pizza-like items were not hot enough. Temperature returned as an issue later, but let’s come back to that topic. Separately, almost everyone enjoyed the liver; it was perfectly cooked and tasted wonderful with a sprinkling of lemon and seasoned, raw, red onions. After the appetizers were through, and a bottle or two of wine were inhaled, most people were feeling fairly full. So when the prodigal portions of entrees arrived we all breathed deeply and put our best foot forward. 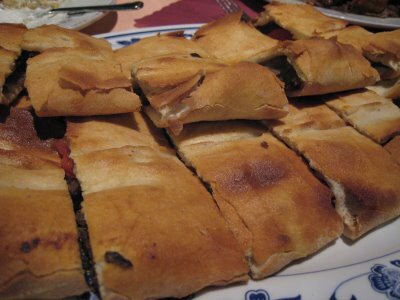 Sticking with their bread skills, I ordered the Donerli Pide, a thick dough crust, stuffed with lamb gyro meat and some red peppers and tomatoes. It was basically a Turkish calzone, sans cheese. It was oily, enormous, and very tasty. Jessica ordered the Mixed Grill, a vast plate of rice pilaf, charred pepper adana kebab, shish kebab, doner, and a lamb chop. The adana was wonderful, perfectly spiced and perfect texture. Most of the other meat was mediocre, particularly due to over-cooking. Everyone at the table shared plates, and most (except Jessica) eemed to think that the winner was either my pide or Sarah and Ran’s ravioli-like dish, Manti, in a thick yogurt sauce. After the eating fest was drawing to a close, we somehow found room in our chest cavities to expand our lungs and bellow out a “Happy Birthday” song, which was louder thanks to the waiters and nearby tables joining in; and then room in our stomachs for the wonderful cake that Jessica made. Overall, the service at Ali Baba was good, the portions were very large (holy cow!, I mean lamb), and the prices were very reasonable. Add in the fact that there is the large space in the back yard and they don’t charge a cake cutting fee, and this is a perfect restaurant for a party. With two people celebrating birthdays, ten of us split the bill for twelve people, including a couple of bottles of wine, a built in service charge, plus we added some more on for good service and it came out to $40 per person. Very fair. 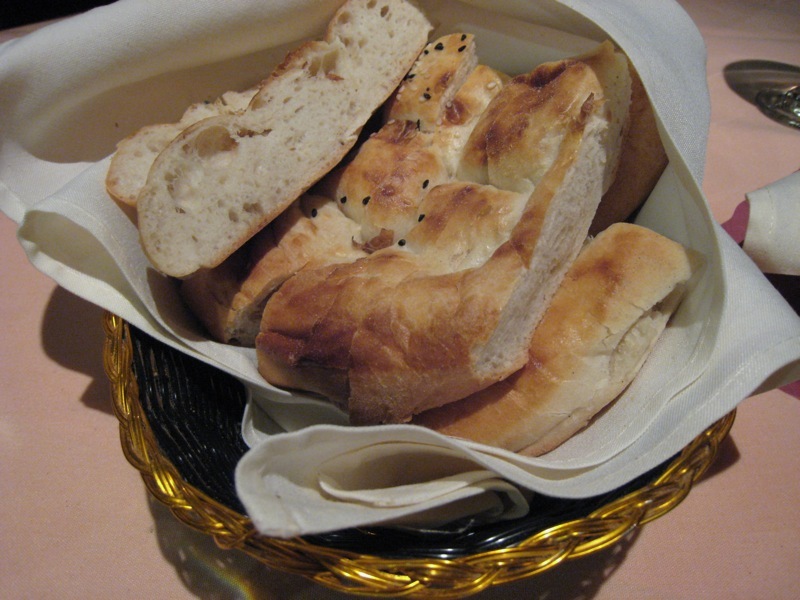 I recommend you catch the next flying carpet to Ali Baba and let us know what you think. For more great pictures of this event, check out Sarah’s Flickr set. posted by Lon	at 09:46 PM	Filed under Middle Eastern, Restaurants. You can follow any responses to this entry through the RSS 2.0 feed. Both comments and pings are currently closed. Sorry, but this comment is slightly xenophobic. You do realize that YOU have an accent as well. It just happens to be more similar to the accents of other people around you. Visitor, it’s only xenophobic if we dislike, hate, or fear them for their accent which is not the case. You are assuming too much.